I created this Christmas card using Snowy Hugs Tilda. I colored it using Spectrum Noir Pens. 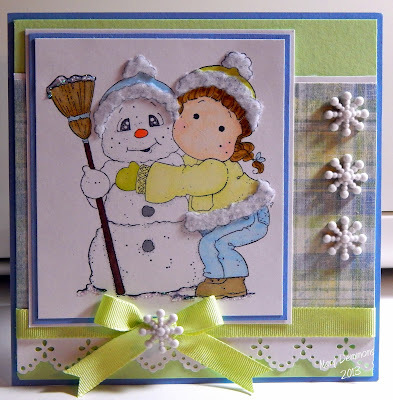 I added crystal stickles to the top of the broom and to the bottom of the snowman. Very cute! Love how you did the trim! Thanks for playing with us at www.7kidscollegefund.com! Lovely card, Mary. Thank you for sharing it with us at Magnolia-licious. Gorgeous card - love your checked paper! Lovely idea to accent the furry trim! A very sweet card with Tilda! Thanks for joining us this week at the Sister Act Card Challenge! Sheena B.